Is Rio Tinto (RIO) A Hidden Gem or a Chunk of Coal? Most investors tend to think that hedge funds and other asset managers are worthless, as they cannot beat even simple index fund portfolios. In fact, most people expect hedge funds to compete with and outperform the bull market that we have witnessed over the past few years. However, hedge funds are generally partially hedged and aim at delivering attractive risk-adjusted returns rather than following the ups and downs of equity markets hoping that they will outperform the broader market. Our research shows that hedge funds do have great stock picking skills, so let’s take a glance at the smart money sentiment towards Rio Tinto plc (ADR) (NYSE:RIO). Hedge fund sentiment towards Rio Tinto plc (ADR) (NYSE:RIO) ticked up in Q2 for the first time in five quarters, though there are still 20% fewer shareholders of the stock compared to early 2017. Shares of the miner were found in 20 hedge funds’ portfolios at the end of June among those tracked in our database. 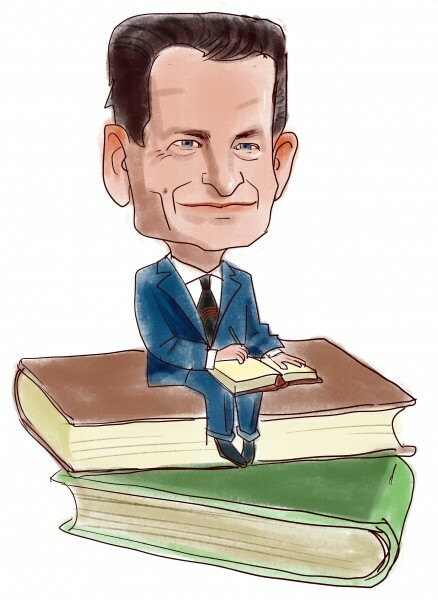 With a nearly 5% dividend yield, RIO is one of 25 Dividend Stocks that Billionaire Ken Fisher is Bullish On, and that dividend looks a lot safer now thanks to the company’s recent work cutting down its debt. To the average investor there are several signals shareholders employ to appraise publicly traded companies. Two of the less utilized signals are hedge fund and insider trading interest. Our experts have shown that, historically, those who follow the best picks of the best investment managers can outpace their index-focused peers by a healthy amount (see the details here). Heading into the fourth quarter of 2018, a total of 20 of the hedge funds tracked by Insider Monkey held long positions in this stock, a rise of 11% from the previous quarter. By comparison, 22 hedge funds held shares or bullish call options in RIO in the middle of 2017. With the smart money’s sentiment swirling, there exists an “upper tier” of key hedge fund managers who were upping their stakes considerably (or already accumulated large positions). More specifically, Arrowstreet Capital was the largest shareholder of Rio Tinto plc (ADR) (NYSE:RIO), with a stake worth $244.8 million reported as of the end of June. Trailing Arrowstreet Capital was Fisher Asset Management, which amassed a stake valued at $227.8 million. Impala Asset Management, Bourgeon Capital, and Pittencrieff Partners – Gabalex Capital were also very fond of the stock, giving the stock large weights in their portfolios. As aggregate interest increased, key hedge funds have jumped into Rio Tinto plc (ADR) (NYSE:RIO) headfirst. Pittencrieff Partners – Gabalex Capital, managed by Nigel Greig and Kenneth Cowin, established the most outsized position in Rio Tinto plc (ADR) (NYSE:RIO). Pittencrieff Partners – Gabalex Capital had $6.9 million invested in the company at the end of the quarter. Ken Fisher’s Fisher Asset Management also made a $227.8 million investment in the stock during the quarter. The other funds with new positions in the stock are John Thiessen’s Vertex One Asset Management and Mike Vranos’ Ellington. 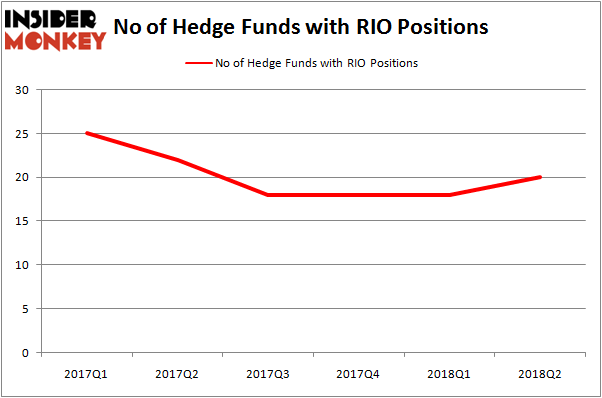 Let’s now review hedge fund activity in other stocks – not necessarily in the same industry as Rio Tinto plc (ADR) (NYSE:RIO) but similarly valued. We will take a look at Schlumberger Limited. (NYSE:SLB), Eli Lilly & Co. (NYSE:LLY), Gilead Sciences, Inc. (NASDAQ:GILD), and Costco Wholesale Corporation (NASDAQ:COST). This group of stocks’ market valuations match RIO’s market valuation. As you can see these stocks had an average of 43 hedge funds with bullish positions and the average amount invested in these stocks was $2.1 billion. That figure was $794 million in RIO’s case. Gilead Sciences, Inc. (NASDAQ:GILD) is the most popular stock in this table. On the other hand Eli Lilly & Co. (NYSE:LLY) is the least popular one with only 33 bullish hedge fund positions. Compared to these stocks Rio Tinto plc (ADR) (NYSE:RIO) is even less popular than LLY. Considering that hedge funds aren’t fond of this stock in relation to other companies analyzed in this article, it may be a good idea to analyze it in detail and understand why the smart money isn’t behind this stock.